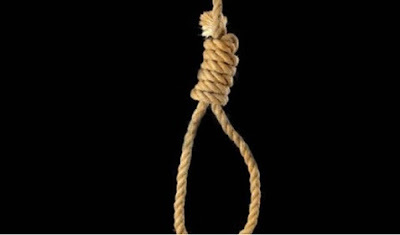 A director in the Lagos State Ministry of Youths, Mr. Oludare Buraimoh, has allegedly committed suicide by hanging in his room. Buraimoh, who lived at Unity Estate, Phase II, Gbonagun, Abeokuta in Ogun State, took his life at about 4.00p.m. on Monday after attending to his son, Dotun, who was reportedly ill. The News Agency of Nigeria reports that many sympathisers, who spoke in silent tones about the incident, were seen in the compound. Dotun told NAN that the incident happened around 4.00p.m. after his father gave him a drug to treat his malaria. “We were both at home; he came to give me a drug and left me thinking he was going to retire to his room. But when I did not hear his voice, I called him, but no response came. “I then alerted the neighbours, who, in turn, told me to alert the police, which I did,” Dotun said. The wife of the deceased said she had yet to come to terms with her husband’s act. “I don’t know what came over him, it is inexplicable. We have been surviving through thick and thin and now that we ought to sit down and enjoy, after all the years of toiling, he decided to take his own life. “He did not show any sign of depression at the time he committed suicide. He was in high spirits; what led him to this remains a riddle,” she said. DSP Rasheed Olaleye of the station confirmed the incident but declined to give further comments, saying that the DPO would be in the best position to handle the enquiries. The body of the deceased has been deposited at the General Hospital, Abeokuta, after due clearance from the police.